Complementing the lens itself, the FUJIFILM XF 56mm f/1.2 R APD Lens with UV and Circular Polarizer Filters from B&H bundles the portrait-length prime with 62mm UV and circular polarizer filters. Designed for the bokeh enthusiast, the FUJIFILM XF 56mm f/1.2 R APD features a unique optical design, flattering portrait-length field of view, and an especially fast f/1.2 maximum aperture. Differentiating itself from FUJIFILM's other XF 56mm f/1.2 lens, this APD version incorporates an apodization filter to produce an aesthetically-pleasing out-of-focus quality to suit selective focus applications. Complementing the unique bokeh-related attributes of the lens is an equally sophisticated optical design, which features both aspherical and extra-low dispersion elements to help reduce a variety of aberrations, color fringing, and distortion. A Super EBC coating is used, too, to reduce flare and ghosting for improved contrast and color accuracy in bright and backlit conditions. Additionally, this lens also features an internal focusing mechanism for quick focusing performance along with a rounded seven-blade diaphragm to further contribute to a pleasing bokeh quality. Prime portrait-length lens is designed for APS-C-format Fujifilm X-mount mirrorless cameras and provides an 85mm equivalent focal length. Especially bright f/1.2 maximum aperture excels in low-light conditions and also offers notable control over depth of field for using selective focus techniques. 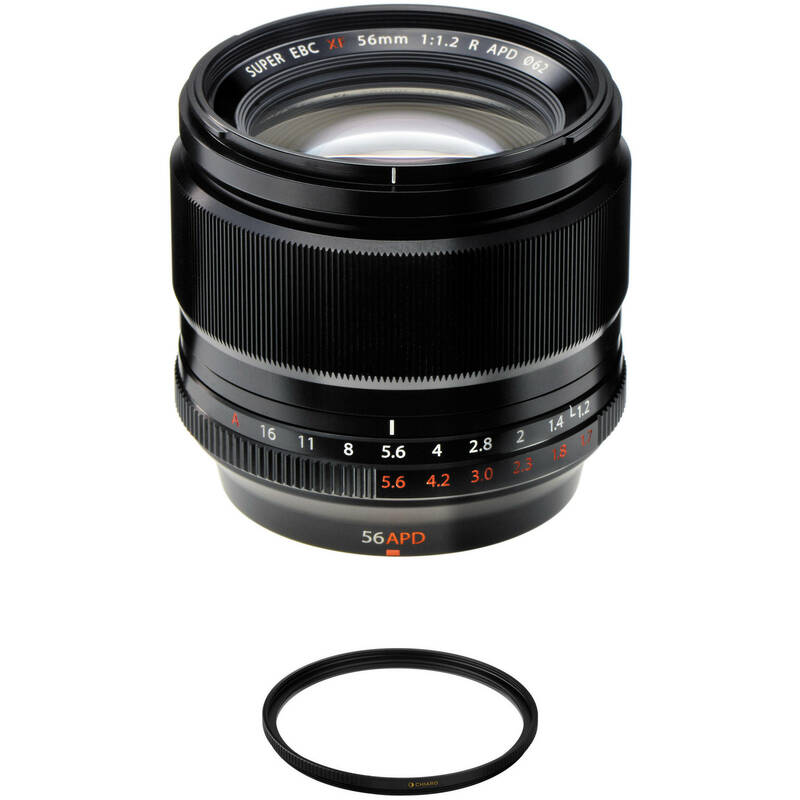 Signified by the APD designation, this lens incorporates an apodization filter in order to produce controllable and aesthetically-pleasing bokeh, which is characterized by sharp main subjects, tremendously blurred background, and an overall three-dimensional quality. Since the apodization filter performs best at wider aperture values, a 3-stop ND filter is built into the lens to aid in controlling exposure. Using two separate sets of aperture values, the red series of numbers indicates the effective aperture value as it relates to depth of field. The standard white set of numbers indicates the actual f/stop number, and the difference between these two sets of numbers indicates the effectiveness of the filter. One double-sided aspherical element limits distortion and spherical aberration in order to realize greater sharpness and accurate rendering. Two extra-low dispersion elements reduce color fringing and chromatic aberrations in order to provide greater clarity and color accuracy. Internal focusing design affords fast and quiet autofocus performance that benefits both stills and video applications. Rounded seven-blade diaphragm contributes to a pleasing out-of-focus quality to benefit the use of selective focus and shallow depth of field techniques. The Hoya 62mm NXT Plus UV Filter is a general use, clear filter designed to absorb ultraviolet light and reduce the bluish cast of daylight. Aside from the reduction of unwanted blue casts, no additional coloration or contrast is created, and adjustments to exposure are not required while using this filter. To prevent internal ghosting and reflections, each glass surface includes five layers of anti-reflection coating. These coatings also offer greater protection to the filter substrate and helps it to stay clean for longer than with uncoated filters. An additional hydrophobic coating results in an improved beading effect when in contact with water for greater cleaning efficiency. This NXT Plus UV filter is constructed from Schott B270 glass for increased clarity as well as color fidelity and features an aluminum-alloy filter ring for durability while remaining lightweight. It is also useful as a general protective filter to leave on lenses at all times. Such filters help to reduce dust and moisture from reaching your front lens element and provide additional protection in case of drops or situations where scratching could occur. 62mm front filter threads allow for use with other filters. Constructed from Schott B270 glass for increased optical clarity. The Hoya 62mm alpha Circular Polarizer Filter helps to reduce reflections and glare by filtering out light that has become polarized due to reflection from a non-metallic surface. The light from the sun naturally becomes partially polarized due to reflecting off electrons in air molecules, causing the light to scatter into what appears as haze. A polarizing filter arranges, and filters, this directionally polarized light perpendicularly to the reflected light, allowing for the absorption of much of this light. This results in a noticeable reduction of glare and reflections from non-metallic surfaces and an increase in the saturation of skies and foliage. Box Dimensions (LxWxH) 3.6 x 3.5 x 0.6"
XF 56mm f/1.2 R APD Lens with UV and Circular Polarizer Filters is rated 4.9 out of 5 by 210. Rated 5 out of 5 by Michael from Fujifilm XF 56mm f/1.2 R vs. 50mm f/2 vs. Canon 85mm f/1.8 Hobbyist bokeh evaluation: Executive Summary:? The 56mm tied the Canon 85mm and exceeded the XF 50mm in terms of bokeh. I shot about 45 hand-held photos of? Christmas decoration from about 8 feet with a background that was 2-3 times that difference.? I really like the 50mm f/2, but it is not a bokeh-meister.? The 56mm f/1.2 vs. Canon 85mm f/1.8 (Canon 5D3) shootout was a draw.? So, I'm quite pleased.? I really like the 5D3+85mm combo, but I no longer need to use it, particularly when travelling.? ?Sorry that I didn't have the 56mm in October, 2017, when I shot a number of photos in which bokeh was desired.? Hence, the purchase of the 56mm f/1.2.? Recommendation:? buy it. Rated 5 out of 5 by Paul from Sharper than my Canon L lenses. This is one of the sharpest lenses I have ever shot with with the exception of some very specialized lenses. I have a ton of flagship Canon L glass and this is equal to or exceeds the image quality produced with those lenses. Colour is great, bokeh is absolutely outstanding, especially for ASP-C sensors, vignetting is minimal to nonexistent, and little to no barrel distortion or any other flaws I can think of. It focuses faster than many of my other Fuji lenses and when it locks on focus, it's accurate. All in all, a very wise investment. Just another reason I've been moving away from Canon's $7,000 flagship cameras and using the Fuji X-Pro1 (and soon to be X-Pro2) exclusively. Rated 5 out of 5 by Jayson from The best portrait lens for Fuji systems The Fuji XF 56mm f/1.2 was the most anticipated (and longest wait listed item) that I've seen in a while. I couldn't wait to get my hands on it, and boy is it worth the wait. I recently ditched my Canon DSLR system for the smaller, Fuji systems. I mostly shoot portraits and commercial work, so the Fuji systems are perfect for me in terms of size, weight, image quality, and a few other things. The XF 56mm lens is an absolutely stunning lens for portraiture. The images are tack sharp edge to edge, even wide open, it grabs AF quickly, and produces absolutely beautiful image quality and skin tones. Rated 5 out of 5 by HJALMAR from Stunning I was hesitating about the idea of purchasing the 56mm f1.2 since I already had the 90mm f/2 and many reviews indicating that they were both portrait lenses and having one there was no need for the other. Finally, I traded one of my lenses with this jewel. Performance and IQ are simply stunning, and yes, focusing is a bit slow but in the X-T2 isn't that bad. However, the images produced by this lens are great, micro-contrast is better on the 90mm f/2, but definition and sharpness from wide open (f/1.2) is very good. No regrets about my decision. Now, my only problem is how to share time between these two lenses. Rated 5 out of 5 by Phi from Among the best portrait 85mm prime lens I had a chance to use a heavy FF Canon 85mm f/1.2 II before and this one is right there although the bokeh is not as good as Canon one due to the DOF. If you're portrait Fuji shooter, it is a MUST lens to own, period. Sharp like hell even at f/1.2, fast enough focus in normal light (note that Im using X-E2), color and contrast are beautiful. The only issue I have with this lens is the limitation of 1/4000s on X-E2 which in bright sunlight, I have to stop down to f/2.8 or more to avoid overexposure. I am still learning it but the result looks good so far, see my pictures. Highly recommended. Rated 5 out of 5 by Anonymous from Love This is the second lens I've bought for my x-t10 and it's great. I previously bought the 35 f2 which is also great, but I wanted something with more reach that would be my main portrait lens. I considered getting the 90 f2 and everything I read about that lens sounded awesome, but I wanted something more compact than the huge 90. When mounted on the x-t10 it feels good in my hand. I do have the extra hand grip attached to the camera but when it's all paired together the camera and lens feel comfortable. Image quality is everything I was hoping for. Pictures are crystal clear and the colors pop. And the bokeh is stunning. I was already in love with the Fuji X system, but this just magnified everything. Rated 5 out of 5 by Keith Alton Photography from Glad I switched from Canon I use this lens for portraits mostly. I also had the opportunity to shoot a concert and I found it extremely useful in the low light. This is by far my favorite lens I own. I recently switched to Fuji after shooting the X Pro-1. It was so much fun to shoot and the image quality was exceptional. After owning the Canon 5d Mark iii, my Fuji cameras have just as great an image quality and the glass is no exception. The 56mm is equal to the 85mm on a full frame. I really loved the cost. Compared to the Canon 85mm f/1.2, I purchased this lens at half the price and equal the quality. This lens is not a fast focusing lens, compared to the 18-55 f/2.8-4, but that is expected. It still focused fast enough and accurate enough to catch some wonderful low light shots. I would recommend this lens to anyone. Rated 4 out of 5 by Mr. Kim from excellent lens, would appreciate faster af i use this lens for: - concert photography where a fast lens is necessary - portraits for the lens length and background separation image quality is great though auto focus is not lightning fast and suffers (expectedly) in low light situations. that being said, the fast aperture lets me get shots that i wouldn't able to otherwise capture in those same scenarios so i don't knock the lens hard for this slight shortcoming. portraits have been where this lens excels for me, no qualms and a wholehearted recommendation for that application. The Olympus Pen F is a Micro Four Thirds mount camera and cannot use Fuji X mount lenses. Is this the best macro lens for the Fuji X-T1? No. The 60mm is the only macro lens, but I'd like to try macro with the new 90mm f2 lens. Does this lens have image stabilization? It does not have an image stabilization. Answered by: Syed Arefinul H.
If you had to pick between this and the 50-140 for general and portrait use, which would you pick? I'd pick the 56mm. Faster, smaller, great for portraits. I already own the Fujifilm 60mm F2.4 macro lens. Is this lens significantly different or better (aside from the larger aperture) to warrant the cost and having another lens to carry? While the 60mm produces very nice bokeh within a narrow DOF, it is horribly slow to auto-focus. The 56mm is a much faster lens (using old-school terminology). It also a bit lighter too. I find this lens much better suited to my street photography work, and rarely ever use the macro at all. Is this Lens cover full frame camera if I mounted on Sony A7 ? I own a Fuji X-Pro1, and this is my favorite lens. Unfortunately, it is designed specifically to be used with cameras that have a smaller, APS-C size sensor, so it would NOT cover the sensor of a full frame camera. When focusing manually do you turn fuji lenses the say way of Canon lenses or the opposite way? Fuji XF lenses are focus by wire and the camera offers you to switch direction for focusing. So you can set it to the way you prefer.